Moscow, with the support of the capital's Mayor Yuri Luzhkov, will hold the First Moscow Flower Festival "Landscape gardening in 18th and 19th centuries", which will take place from July 14 to September 10, 2001. The goals of the Festival are: revival of the country estate "Kuzminki" - a memorial of Moscow landscape architecture; demonstration of traditional techniques used in estate landscape gardening in the 18th and 19th century; raising of the level of flower decoration in Moscow. State-owned and private companies specializing in landscape architecture and flower-growing were invited to take part in the Festival. The main requirement to the flower bedding and flowers to be presented for the contest is compliance with the traditions and spirit of the time. 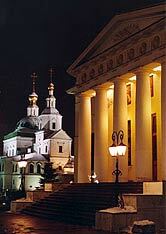 The jury will announce the contest results by the Day of the City in Moscow (early September).